With summer around the corner, we have been grilling out nonstop and I have been taking every opportunity to be outdoors with my family. In the winter, we use the crock pot a lot, but in the summer we are all about grilling outside, eating lots of salads, and making lots of yummy summer drinks. For my two year old, we normally don’t go too crazy with her beverages. She gets either skim milk, or juice to drink, and if it’s juice we cut it at least by half with water. But, sometimes you have to let loose and have a fun drink. 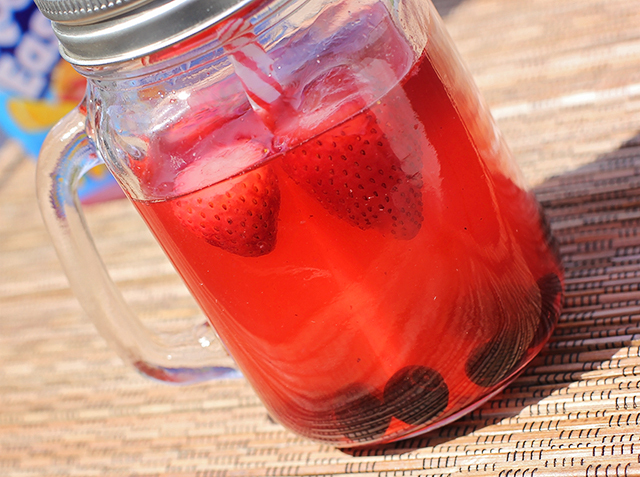 And if mom is having her sangria, why not let the kids enjoy some too? Non-alcoholic of course, but still delicious and kid friendly. 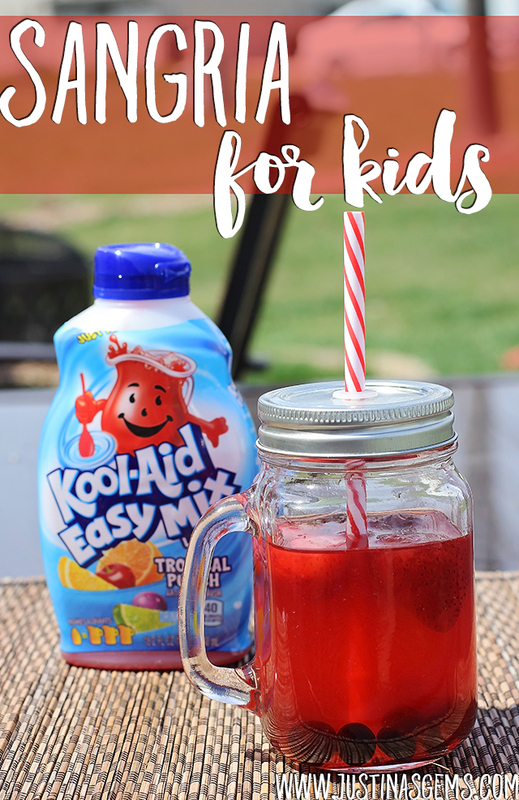 I have been experimenting with delicious drinks for my daughter and her friends to enjoy at cookouts this summer, and my latest creation is my kiddie sangria! 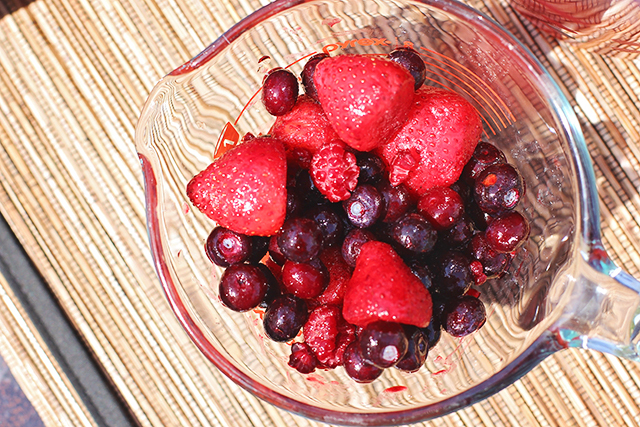 A delicious fruity beverage for kids or adults to enjoy! Even though the recipe is printed above, I thought I would give you some cliff notes. I wrote one heaping cup of frozen berries. You could use any berries you want, but I like frozen the best. There is no limit to how much you use, but I felt that for my huge pitcher, a little over a cup was a great amount. 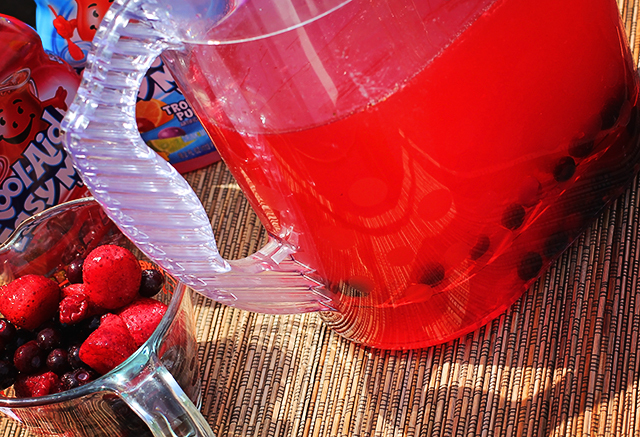 Frozen works best because as they melt, the berries tend to “bleed” more into the drink than a regular berry would have. My mixture here is of strawberries and blueberries. They are commonly sold together in the same bag, so they should be easy to find! When the berries are frozen, the blueberries will sink to the bottom and the strawberries will float on top like ice cubes! As they melt, they will sink down. You can drink this concoction right away, without letting it sit for a few hours, but it will taste mostly like Kool-Aid. I love the mixture of tropical punch flavors, the berries, and also the coconut water as it all has a chance to sit together in the same pitcher for a while. In the future when I make more kiddie drinks, I think I am always going to sneak some coconut water in there. Also, the pitcher below has a “shloosher” in it. That’s my totally technical term for the thingy that moves up and down like a plunger so you can remix your drink ingredients. Sometimes when you mix lots of things together, the juices can separate when they are sitting still in the fridge for a long time. You don’t have to let that happen to you! Just shloosh them back together before pouring a glass! All of the ingredients are also available at Walmart! I stopped in the other day when they were doing an in store demo. I had some lunch there and we ran errands and went about our day. Love how easy that store makes my life! Kool-Aid Easy Mix comes in Grape and Cherry too but I haven’t come up with any drinks for those yet. Tropical Punch seemed like a good place to start, because who doesn’t love punch, right? If I have one tip for you that would be, don’t let your kids drink this on white carpet! That’s why it’s the perfect drink for grilling out. Keep it outside where it won’t make a mess! 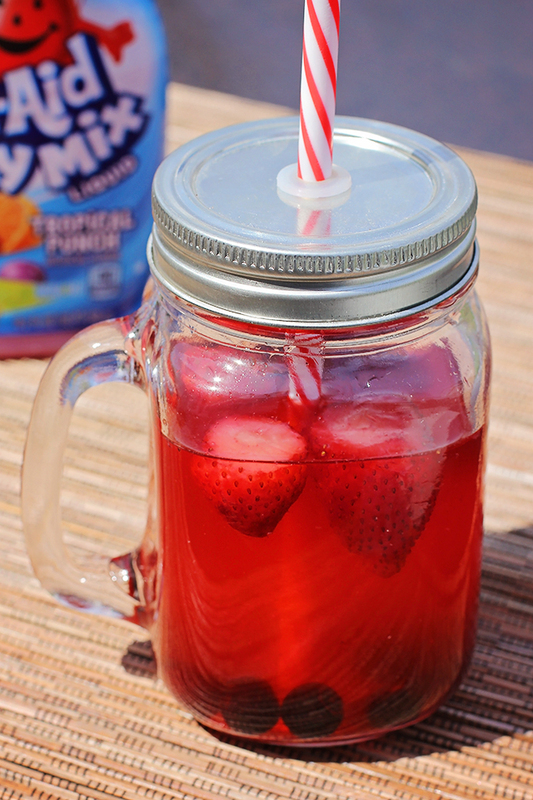 Do you have a favorite summer drink for your kids? Do share!